On Wednesday, Science and Sport Minister Kirsty Duncan stopped by Jane’s restaurant to announce a total federal investment of over $10 million in research infrastructure funding for recipients awarded in the latest round of the Canada Foundation for Innovation’s (CFI) College-Industry Innovation Fund (CIIF) competition. 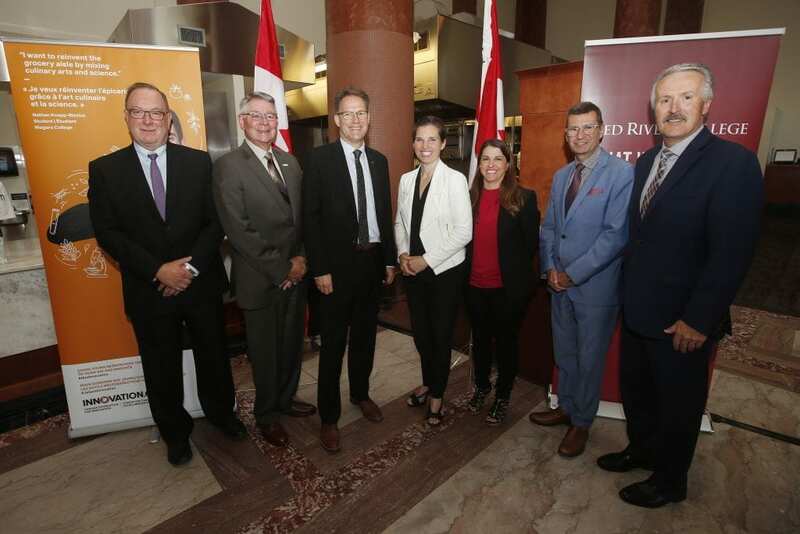 Red River College was one of eleven successful colleges and polytechnics across Canada, and now thanks to the CFI’s investment of more than $1 million, construction is underway to build the College’s first-ever multi-functional culinary research centre. “Red River College’s Culinary Research & Innovation (CR&I) continues to grow, and expand its work with students and industry partners to develop healthy and delicious new products from Prairie ingredients,” said Ray Hoemsen, Executive Director of Research Partnerships & Innovation. This state-of-the-art research lab will enable researchers, faculty and students to collaborate with the food and agriculture industry on projects that will enhance food safety research, and address changing consumer needs and challenges such as food waste. The new space and equipment will primarily be used for research with industry partners, but will also be available to instructors and students seeking to enhance their education and professional development. “Red River College is a leader in culinary research and innovation,” said RRC President Paul Vogt. “To date we’ve worked on more than 40 different projects with local food and agricultural producers in Manitoba to help them innovate and bring new products to market. The CFIs grant, delivered through its College-Industry Innovation Fund, is part of a $2.74-million renovation and equipment acquisition plan for the space at PGI. Creation of an award-winning all-hemp macaroon, as part of a product line for Piccola Cucina. Our team used locally sourced hemp instead of almonds; the new products are now ready for shelf-life testing. Development of a miso paste using spent grain from local microbreweries. Working with the Manitoba Agri-Health Research Network, our team turned what would have been waste into a tasty value-added product. Development of a new recipes and applications of a prebiotic aimed at improving digestive tract health, in partnership with nutritional supplement provider MSPrebiotic Inc. Under the supervision of a Research Chef, RRC students developed recipes that met requirements related to dose requirements and temperature limitations. Creation of a new beer-flavoured pretzel seasoning in partnership with local snack mainstay The Pretzel Place. Our team worked with RRC alumni and The Pretzel Place owner Sue Leclair to develop this new twist on flavour, now available at both Winnipeg locations; Shaw Park and Investors Group Field.